My family arrived at the monastery in Belém on Sunday morning. It was the first thing we did after arriving in Lisbon besides dropping our bags at our hotel. We were exhausted, definitely, but we were also thrilled to be in a new place with nothing to do but experience its culture. 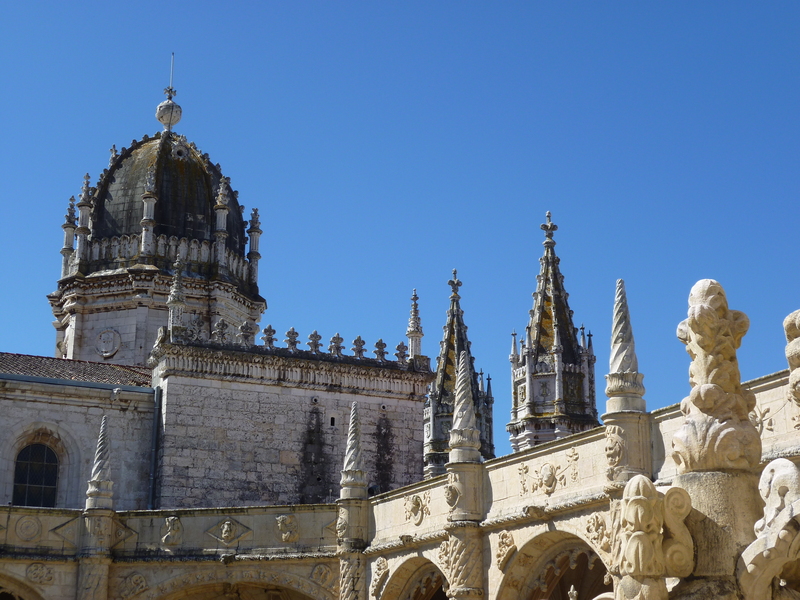 The monastery in Belém is nothing short of incredible. It is made up of two parts: the church and the cloisters, where the monks spent their leisure time. We visited the cloisters first, and the whole courtyard area was bustling with tourists admiring the unique Manueline-style architecture. Named after King Manuel I, this style represents a combination of many aspects: Gothic and Renaissance influences, Rococo tiling, family crests/coats of arms, nautical-inspired decorations (let’s just say there’s an obvious rope theme throughout the buildings), and unusual gargoyles like monkeys and crickets. All of the doors and windows are ornately decorated and combine these motifs to create a sense of unity and intention within the blatant discordance of elements. 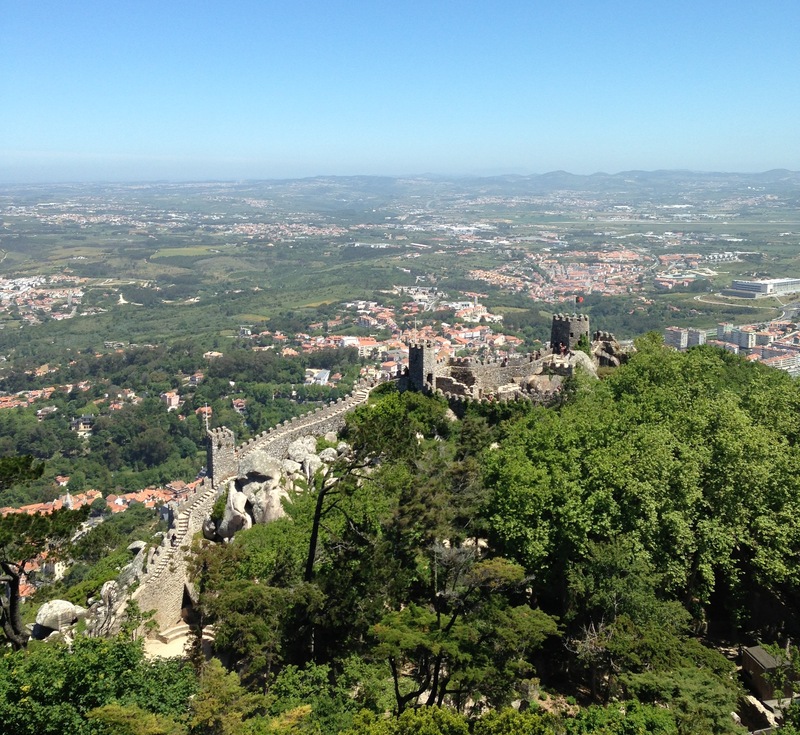 Since then, we’ve also seen the Manueline style extend to the Portuguese city of Sintra, a 45-minute train ride from Lisbon and an excellent day trip. 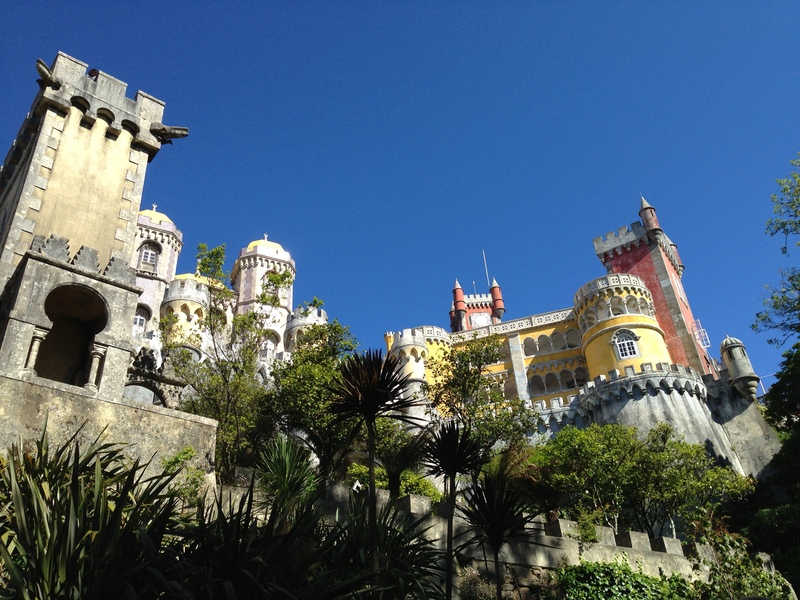 First we visited the colorful Palácio da Pena (Pena Palace, pictured to the left), which also has unusual gargoyles, this time alligators. The palace’s interior took the usual amalgamation of elements typical of Manueline architecture to a whole new level by combining antique and modern. Furniture from the 18th century adorned one room, while the next had a telephone where the king could listen to opera performances without having to travel to Lisbon to hear them. Four generations of royals lived in the Palácio da Pena until the aristocracy was overthrown in the early 1900s. This explains the reason for the combination of old valuables and newer technologies, yet it didn’t make the contrast less strange to the eye. Next we visited the Castelo dos Mouros (Castle of the Moors). Unlike the palace, this site didn’t have much of an interior because it was mainly used as a strategic outlook point. We climbed the uneven cobblestone steps as far up as we could go and the view was absolutely stunning. At first I didn’t even plan to climb up all the way–jet lag and a very active day had worn me out–but I am thrilled I ended up going for it. The view was definitely worth it, and I recommend it for anyone who is able-bodied and up for the challenge. There’s nothing like being high up and feeling like you own all the gorgeous palaces (plus the entire city of Lisbon) below you. 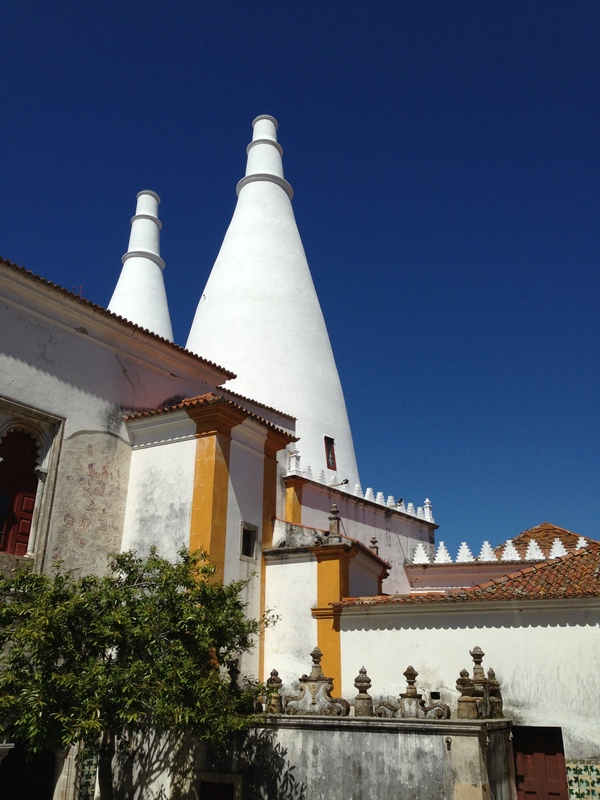 The last stop was the Palácio Nacional de Sintra, a white-washed building with two distinctive chimneys and interior rooms that are all named after whatever distinguishes them from the rest. These titles are often inspired by an element in each room’s decor, often the design on its carefully painted ceiling. It shouldn’t come as a surprise that this palace is also created in the Manueline style and notably touts impressive tile work that makes it stand out from the other two main Sintra attractions. So far, I’m loving Portugal, and my mom admitted that she’s glad I talked the family in to visiting the country. When planning our trip, which will soon take us to Spain, she worried that the two country’s cultures weren’t different enough. She regarded Portugal as just a smaller, poorer version of Spain in which none of us can speak the language. Yet we are all coming to realize it is so much more than that–Portugal has its own style and architecture that make it important and captivating, even in comparison to Spanish culture. Traveler Tip: Admission to the monastery’s church is always free, but entrance into the cloisters usually costs €7 per person. On Sundays until 2pm, however, there is no fee to enter the cloisters. On top of that, visiting on Sunday morning also meant we got to see part of the local mass ceremony, which added a layer of cultural experience that we wouldn’t have had otherwise. Because of this, I highly recommend the Belém trip as a Sunday activity if possible!